May 10, 2015 Curcumin Supplements for Joint Pain: A “Curry” a Day? HEALTHY INFLAMMATORY RESPONSE – Curcumin, an extract from turmeric, is a powerful polyphenol known for supporting joint health, digestion, immune health, and a health inflammatory response. Curcumin Advanced uses Curcumin C3 Reduct with 95% tetrahydrocurcuminoids. DIGESTIVE HEALTH – Curcumin Advanced combines Curcumin with Bromelain and Ginger Root Extract as a natural way to enhance digestive health and help ensure complete absorption and potency. SUPREME ABSORPTION – To overcome Curcumin’s poor absorption, Curcumin Advance uses Bioperine and AstraGin to ensure maximum absorption. Bioperine is a black pepper extract standardized to 95% piperine. AstraGin is a combination of plant extracts shown to increase nutrient uptake. HIGH GRADE - NutraBio uses only the best, and this product is no exception. Curcumin Advanced is non-GMO, gluten free, soy free, vegetarian, third-party tested, certified kosher, and made in the USA. 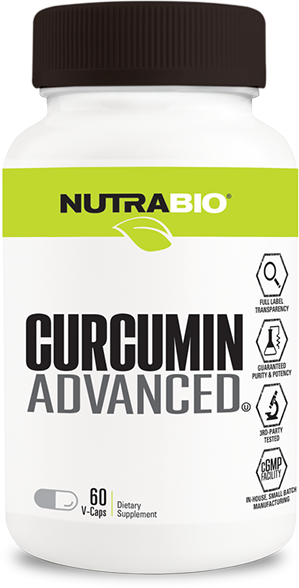 THIRD PARTY TESTED, FULL DISCLOSURE – Like all NutraBio products, Curcumin Advanced is tested by an independent third party lab to ensure it is both pure and meets our strict quality standards. All NutraBio products feature fully transparent labels with no proprietary blends.